Anhydrous ammonia is an economical and practical way to establish a base application of nitrogen. Traditional cold-flow anhydrous application systems rely on tank pressure for distribution and injection. That makes these systems dependent on air temperatures - and is one reason for uneven distribution from knife to knife. It also limits the application window - too cold and there is no flow. 360 EQUI-FLOW keeps ammonia in its liquid state all the way to the knife, increasing row-to-row accuracy. And its pressurized system can operate efficiently and accurately at low temps. Ammonia from the tank is delivered to the initial filter. In the tower, the ammonia is separated into gas and liquid. The vapor is condensed back down into liquid and it all moves to the pump. The hydraulically driven centrifugal pump pushes 100% liquid ammonia through the flow meter and control valve to the manifold. The equal distribution manifold equalizes flow to each outlet. Every row gets the same amount of ammonia in liquid state. Tests with conventional systems and 360 EQUI-FLOW show the difference in row-to-row accuracy. At 120 pound application rate, the traditional system varied by over 20% and under 20% with a total error range of 45%. The 360 EQUI-FLOW application range was plus/minus 4%. Centrifugal pump condenses NH3 into liquid for even application, regardless of rate and temperature. 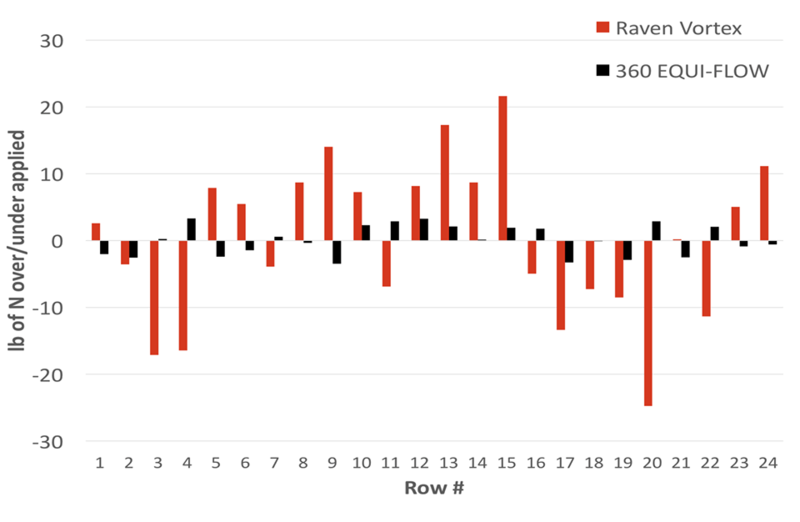 Row-to-row variation shows up at the worst time for corn production. 360 EQUI-FLOW produces precision application for row-to-row accuracy. Improved sealing at injection point, minimizing losses. Keeps NH3 liquid all the way to the injectors. Improved sealing at the injection point.